When the past knocks, someone must answer. In a bustling suburban neighborhood in Manchester, England, sits an unassuming house. There is no sign of life behind the unwashed windows, but Robin Marshall is inside. Driven by fears and obsessions, racked by anxiety, Robin is frantically pushing her body through punishing workouts, eating little, haunted by what happened to her family when she was a girl. Robin’s only connection to the outside world is through her rear windows and the lives she spies upon in the apartment house across the way. Then a stranger starts pounding on her door. Sarah Marshall is Robin’s twin, estranged from her sister after their parents’ betrayal and a violation at the hands of a man she should have been able to trust. Sarah has recently lost custody of the child she loves more than anything and has set off on her own, hoping that somewhere in England she can find Robin, the braver twin, the rock star, the survivor, the savior. These two young women, polar opposites, cannot go on unless they reckon with the past. While Sarah, slowly unraveling, searches for her sister’s hiding place, Robin sees another life hanging in the balance in the lighted windows across the street. It is a life only Robin can save—as long as she never looks away. In a novel that is stunning in its twists, shocks, and gripping psychological suspense, two sisters find themselves on the razor’s edge of sanity. Untold secrets, a ghastly lie, and suffocating guilt hold them back. Only one astounding act can set them free. And one last revelation will leave readers gasping in surprise. Holly Seddon is the author of Try Not to Breathe. She was born and raised in the southwest of England and now lives in the center of Amsterdam with her husband and their four children. In a fifteen-year career, Seddon has been privileged to work in some of the UK’s most exciting newsrooms. She has been published on national newspaper and leading consumer websites, and in magazines. Seddon has been writing short stories since childhood. 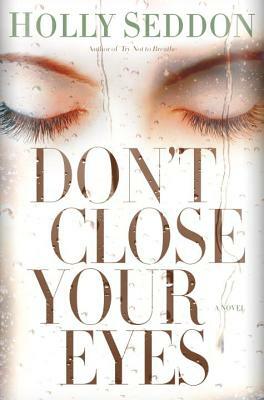 Don’t Close Your Eyes is her second novel.